The final installment in what has been a wonderful new works series presented by Theater Latte Da is a musical re-imagining of the Eugene O'Neill play Beyond the Horizon. It was his first play to be produced on Broadway and the first to win a Pulitzer Prize, but is little seen today (I was previously unfamiliar with it). New York City based musical theater writers Chip Klose (book) and Michael Holland (music and lyrics) are re-telling this story through music, in a brand new piece receiving its first workshop and public performances this weekend with Theater Latte Da. Like all of the NEXT works, it has great potential and is beautifully presented by our local talent, with direction by Peter Rothstein. In this version of O'Neill's story, brothers Travis and Robbie are in love with the same girl. Book-smart Robbie is about to go to college on a scholarship when he finds out that Amy is pregnant. He decides to stay, and Travis, Amy's old love, joins the marines as a means to leave town and family behind. Robbie and Amy live with his parents and struggle to make a life, as everyone feels Travis' absence. Although plot points have been changed, this is still an O'Neill story and therefore not a happy one, but one with great emotion and complicated family dynamics, the perfect fodder for music-theater. I loved the music in this piece, and would probably love it even more in its intended orchestration - a few guitars and a fiddle. The creators describe the style as "incorporating pop, rock, folk, and country elements with echoes of Appalachia," but it's hard to achieve that with just a piano (even when the pianist is Denise Prosek). But even so, it's a great score with intricate harmonies, giving each character their moment to shine. And you couldn't ask for a better cast than this one - Eric Morris and Jared Oxborough as the brothers (the former stepping into the role just the day before the first performance! ), Cat Brindisi as Amy, and Kevin Leines and Betti Battocletti as the boys' parents. I'm always amazed at how full these NEXT performances are despite the fact that the actors have only had a week or two with the material and have the script in front of them. 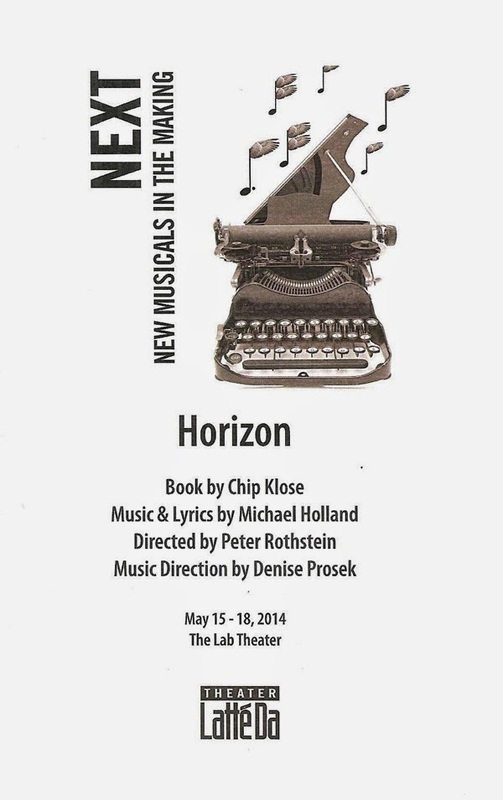 If you're free this weekend and interested in witnessing the future of music-theater, head to the Lab Theater for one of the two final performances of Horizon. This has been another great year for NEXT: New Musicals in the Making. From The End of September, a very Minnesotan story with a wonderfully complex score, to the hilarious improvised musical Some Assembly Required (aka Used Pontoon), to Horizon, a re-imagining of a classic American play, I've really enjoyed witnessing these unpolished gems and hope to see all of them again in the future.